LWC meets on Thursdays throughout the year (with a short break over Christmas) from 7:00 to 9:00 pm at Phoenix Square. Phoenix Square is located in the centre of Leicester City within the Cultural Quarter and it has its own licenced café which serves meals as well as drinks. A pay and display car park is available next to Phoenix Square (entrance on Burton Street LE1 1TE). 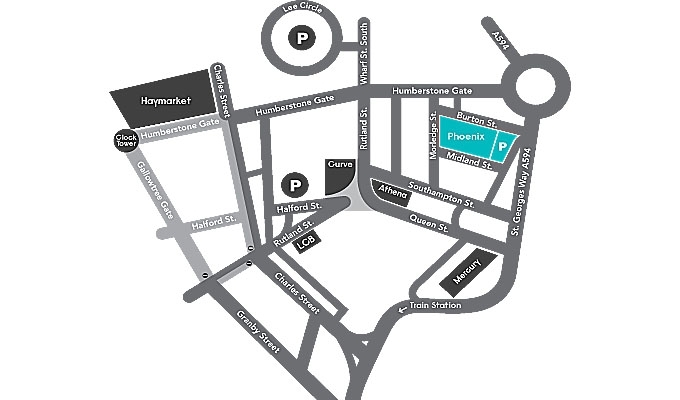 For alternative parking the Rutland Centre NCP car park on Halford Street (LE1 1TQ) is located just a short walk away from Phoenix. Parking is also available around Phoenix. On single yellow lines, parking is free after 6pm. In pay and display bays, parking is free after 6pm and all day on Sundays. Please always check the signs as circumstances may change and temporary restrictions may be in place. The majority of meetings are ‘manuscript evenings’ where club members read and receive feedback on work-in-progress. During the summer holidays, manuscript evenings are open to non-members, for a nominal, on the night, fee. We meet in the café downstairs from 6.30pm onwards, where the manuscript book will be available in order to sign up for a reading slot, and move up to our room for 7.00 pm. Up to 2,000 words or 2 poems can be heard per person and we usually manage to hear from between 6 and 8 writers per evening. An interactive white board and overhead projector is available for poetry. From time to time LWC hosts talks by authors, agents, editors and those working in the publishing industry. These speaker evenings are open to the public. Where we have sponsorship to cover our costs we are able to provide these events free. At other times there may be a reasonable entrance fee.